On August 24, 2016, more than 175 makerspaces from around the country were invited to Washington, DC for the “Makerspace Organizers Meeting” convened by the White House Office of Science and Technology Policy (OSTP). The purpose of this meeting was to “build the President’s Nation of Makers initiative” and “gather those who run, support, and/or are involved with makerspaces around the country to increase awareness, engagement, and support for the movement while simultaneously connecting makerspace organizers to Federal resources (grants and programs) they otherwise might not know exist.”. Representing Rhode Island were Shawn Wallace (AS220 Industries), who presented on “Making a Makerspace“, and Matt Stultz (Ocean State Maker Mill), who gave a “Maker Lightning Talk“, along with Steve Heath (FabNewport), Howie Sneider (The Steel Yard), and Todd Thomas (Tinker|Bristol). Tom Kalil, Deputy Director of the OSTP, opened the meeting by describing the Maker Movement as a “priority for President Obama”. Kalil sees it as a four-fold interest that addresses and promotes: (1) “curiosity, tinkering, teamwork, self-efficacy, and creative confidence”; (2) “getting young people excited about STEM and advanced design and manufacturing”; (3) “innovation, entrepreneurship, and the revitalization of American manufacturing”; (4) and “increasing the number of problem solvers”. Kalil also stresses the importance of recognizing the Maker Movement as a literal movement with definable goals, instead of just a figure of speech. He challenged those present at the Makerspace Organizer Meeting to increase accessibility and the number of people involved. The meeting also included five workshop sessions that brought together makers from diverse cultural, economic, educational, and regional backgrounds. Topics included building entrepreneurial ecosystems, marketing for makerspaces, strategies for connecting with other regional makerspaces, and how makerspaces can work with local, state, and federal governments. Rhode Island had the strongest US state representation at this event, sending the most makerspace representatives in relation to population and state size. Rhode Island’s makerspace representatives, now organizing under the name of the Rhode Island Maker Cluster Howie Sneider, director of the Steel Yard says “I can now say wholeheartedly that there is a network of like-minded ingenuity spread across this country, and that ‘making’ is more than a buzzword, it is a movement, and we are proud to be a part of it.”. 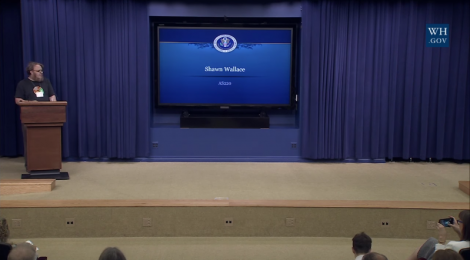 AS220 is recognized by the White House as a “nationally-known makerspace”. This meeting was the second time this year that AS220 was requested to appear at the White House to be recognized for its role in the Maker Movement. Umberto Crenca, AS220’s founder, was honored in June as a “Champion of Change for Making”. Additionally, AS220 board member and one of the minds behind AS220’s Rhode Island Mini Maker Faire, Brian Jepson, assisted in the execution of the first-ever White House Maker Faire in June of 2014. Todd Thomas, President & Co-Founder of Tinker|Bristol, was selected by the White House Office of Science & Technology Policy this July to be the Maker Ambassador for Rhode Island as part of the White House’s Nation of Makers effort. Tinker|Bristol, with the help of others across the state including host sponsor New England Institute of Technology, is producing the RI Maker Manufacture Summit this October bringing together Manufacturers, Makers, Educators, and Policy Makers in RI to develop a collaborative boost to the RI manufacturing economy.